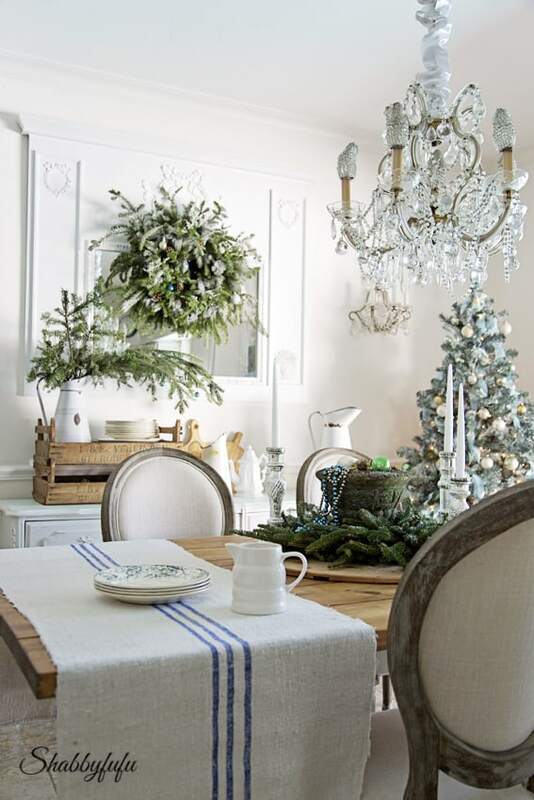 French country rustic elegant Christmas is fairly typical if you’ve been to France during the holiday season. I’ve been fortunate to visit mostly Paris when the streets were freezing cold but warm from the glow of holiday lights. 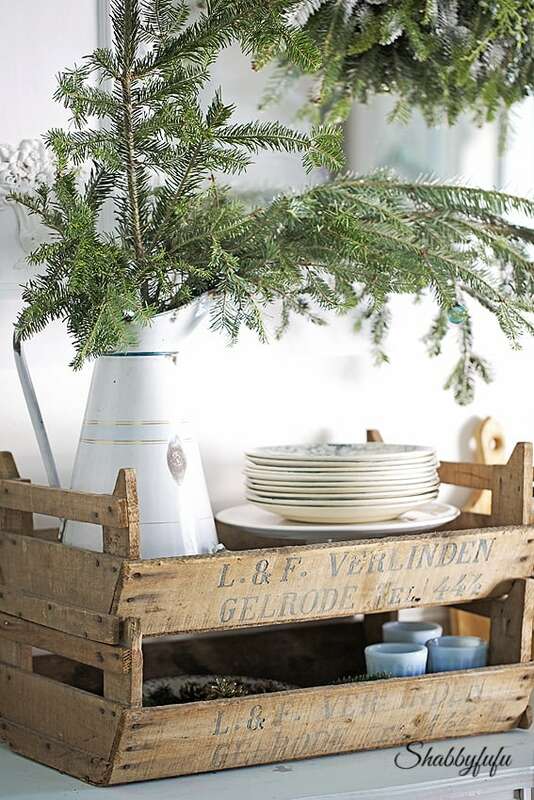 Using simple natural elements just make everything pretty year round and especially for Christmas. 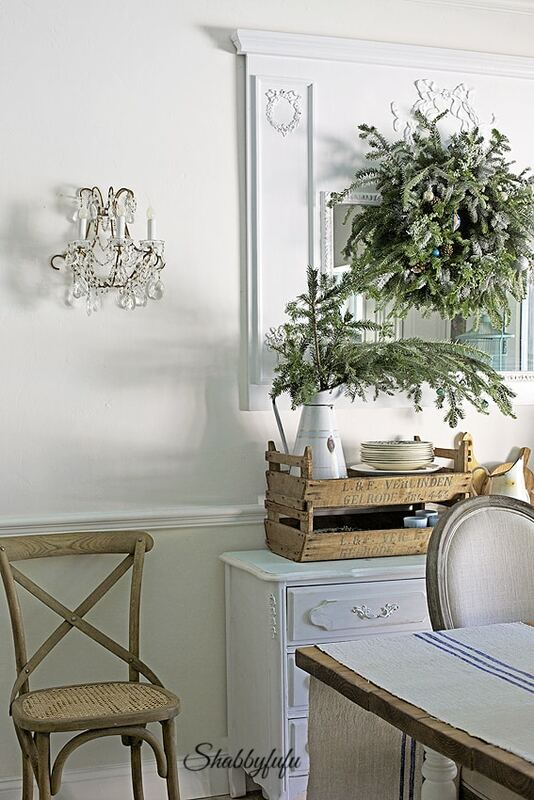 In the dining room this year I’m keeping it somewhat simple with a rustic French country feel. I decorate with what I love and often what is available at low cost seasonally. It’s really not unusual in the least to have a pool when you live here in the Miami area. Our dining room is not a formal room and is open concept to the kitchen and weather permitting we entertain outdoors. On this day the doors were flung wide open, but that is rare. In keeping with the our casual lifestyle, I used lots of fresh greenery around the house for Christmas…as I usually do. The wreath was purchased for $7 at Home Depot and I “enlarged it” with cuttings from the tree lot there. 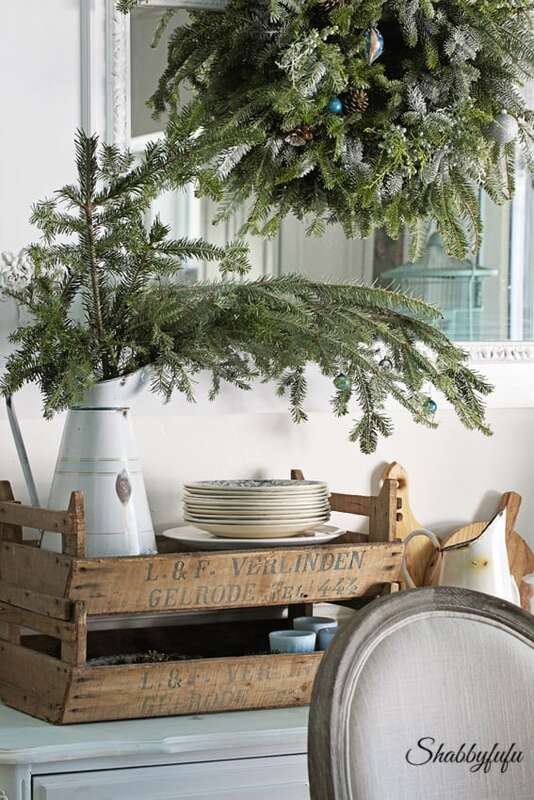 In the French enamelware pitcher are some more of those cuttings with a few tiny vintage feather tree ornaments hanging gently. leA little touch of mercury glass with diner tapers on the dining table. 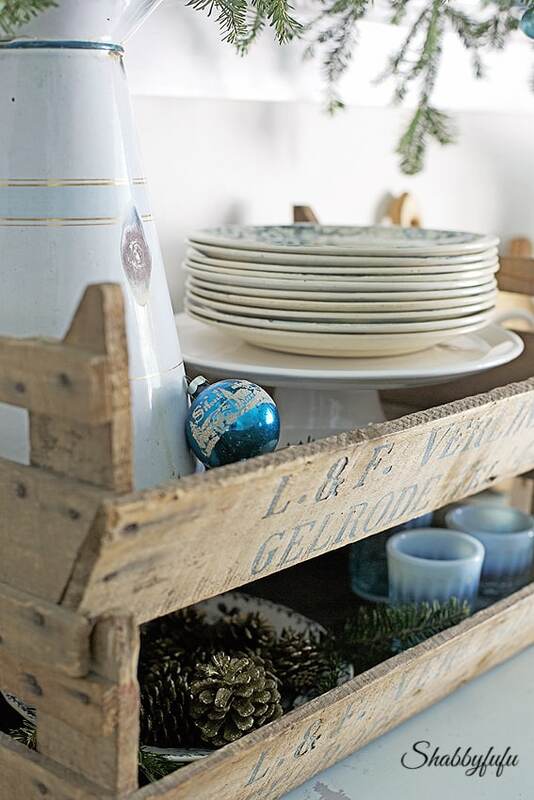 Recently I acquired these vintage French fruit crates that are perfect for a French country rustic elegant Christmas. I stacked two and am using these on the buffet for extra dishes and other table overflow. The combination of elegant French chandeliers and lighting set against the rustic touches of wood really speak to my personal style. A favorite vintage blue Christmas ornament that says Silent Night. 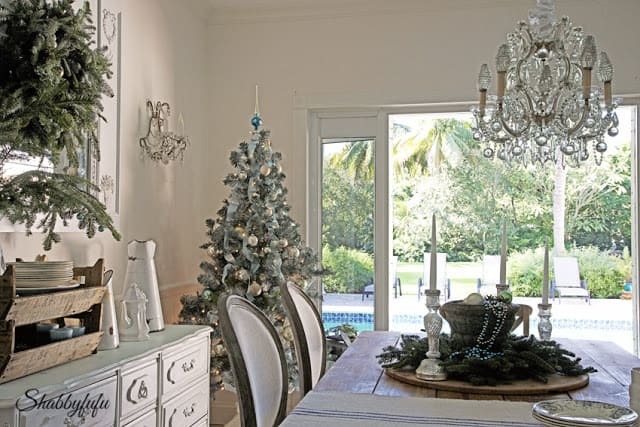 Touches of blue are big for me this year in our holiday home. I found this old garden pot outside and it’s been neglected for years with the perfect patina. I talked about this tree that I rescued from the trash HERE, and I’m definitely not above repurposing that way. It’s been painted (by me), flocked (by me) and filled in with fresh greenery and then embellished with all vintage ornaments and vintage French ribbon in a Tiffany blue shade. I talked about the living room in THIS post and will be doing another post soon with a few easy ways to quickly change things up by swapping out key accessories, so look for that one next week. Everything is so pretty. I love your color scheme! 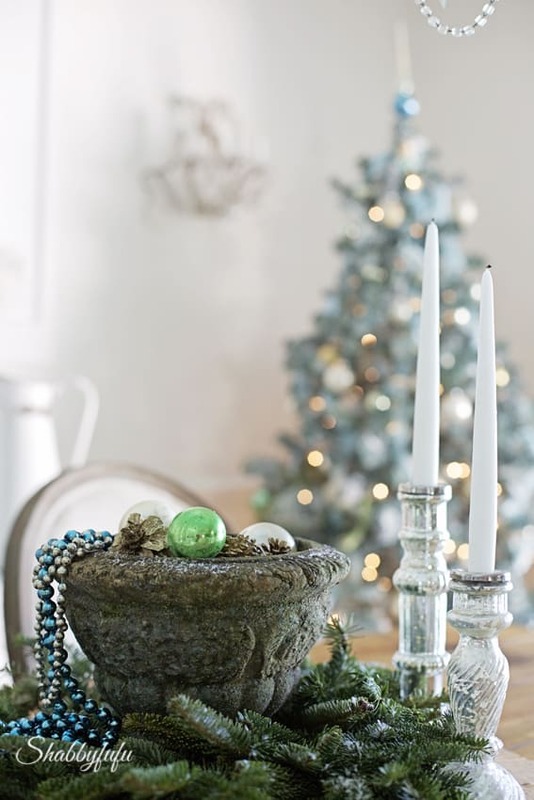 Oh Janet, you do rustic and elegant to perfection….so beautiful…love the colors of the silvers and blues with the great greens….and that pot with the fabulous patina is amazing….love the sneak peek of the living room…and that tree in that room is beautiful! 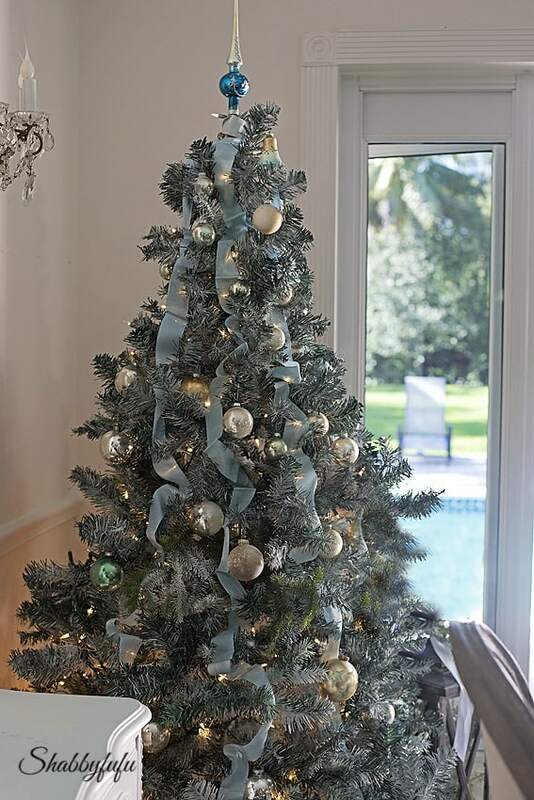 Beautiful Christmas decor in that pretty shade of blue. I love adding fresh clippings to get that fresh cut Christmas tree smell. Beautiful Janet! Love your tree. You always inspire me!! 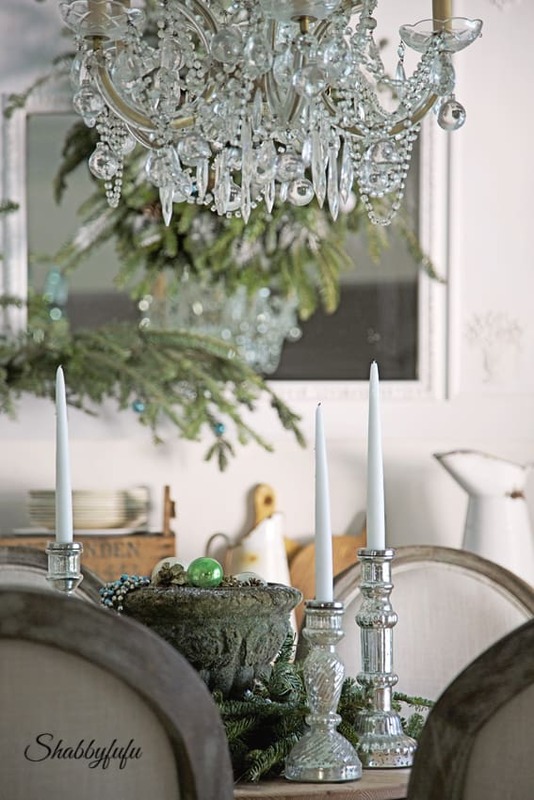 This post is filled with absolutely stunning festive touches that I love! So pleased to be on the bHome tour with you!! 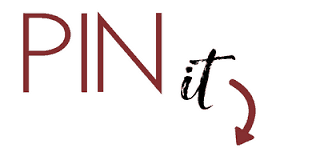 Your style is very much my style right now…always evolving and rustic and french with a bit of luxe are where its at! Beautiful as usual Janet!! You never cease to inspire me…. Oh my gosh I adore everything…I could live in this space and not change a thing! Thank you for joining the tour and for being so nice to me this year. I have loved getting to know you. Merry Christmas! Stunning, warm and cozy! Thanks for all the great ideas! What a gorgeous dining room!I've been thinking about redoing my dining room. Thanks for the inspiration. Pinned it! Gorgeous!! You have decorated beautifully for Christmas. What a pretty room Janet! Its so funny to me to see a Christmas tree with a pool in the background! I’m on the east coast and that would never happen here!